Innate biases against diversity. There exists in many people a desire to preserve various uniformities. Many individuals, perhaps most individuals, prefer individuals who are like themselves: who look like themselves, act like themselves, talk like themselves, and think like themselves. In the weeks leading ... to the 2006 election, the researchers selected a randon sample of people all over the country to participate in a computer-based study. First, they were asked to upload a recent photograph of themselves.... Then, the week of the election, they were shown a picture of each candidate and asked to complete a questionaire asking them to indicate how they felt about the candidate on a host of measures. Now, they weren't given any other information about the candidates besides their pictures, yet they were asked to make judgments about how honest, moral, and kind the candidates appeared, as well as how the candidates made them feel, how likely they would be to vote for them, and the like. But there's a twist. Unbeknownst to the participants, the experimenters had used photoimaging software to morph participants' own photographs with the candidates' faces, using a ratio of 60 percent candidate to 40 percent participant, which was just subtle enough that the participants wouldn't be able to consciously detect the manipulation.... What was the point? Bailenson and colleagues wanted to know if making the candidates look more like the participants would be enough to change their judgments and preferences. It was. Results showed that across the board, people had a stronger preference for the candidate whose photo was blended with theirs. No matter who the candidate was or what he stood for, the people rated the candidate whose picture had been morphed with their own as being more honest, moral, kind, and so forth --- and they indicated they would be more likely to vote for him. Pride & Hubris. The Objectivist view of pride is actually much more conventional than Rand and her disciples make it out to be. Earned pride (i.e., pride based on "objective" accomplishment) is held as a virtue; unearned pride (i.e., pretensions to pride based on no real accomplishments) is considered mere arrogance or pretention. These views are considered daring because they stand in opposition to Christian-inspired admonitions against the "sin" of pride. But fact is that such admonitions don't really exercise much influence on the attitudes and behavior of most people, whether they profess a theoretical attachment to Christian doctrine or not. Most people are proud of their accomplishments and proud of their country, regardless of theological attachments, just as most people abhor the false pride of pretension and hubris. Objectivists begin to lose sight of reality on this issue when it comes to two main issues: (1) detecting hubris in themselves and (2) evaluating hubris in others. Denial of Jealousy. From a naturalist point of view, it is difficult to escape the view that man is a product of an evolutionary process, and that this process plays an important part in the development of man's character. Since a species, if it is to survive, must both reproduce and care for its offspring, it is likely that the process of evolution will favor those individuals who have a strong predisposition to reproduce and bestow care upon their progeny. Hence the near universality of both sexual desire and jealousy. In comparing Rand's view of human nature with what we find in the study of actual human beings, the astute observer can hardly fail to notice the degree to which Rand has stripped away everything she found annoying in man. 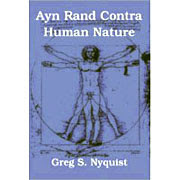 In distinguishing all those elements that separated man from the animals, Rand, in effect, implicitly suggests that man is not essentially an animal. His animalistic characteristics are mere accidents. Man's essence is his "reason" and his volition. These elements supercede the natural or animalistic characteristics. Man has no "instincts" or innate predispositions, only such acquired dispositions as he imbibes from the people around him or his own thinking. Although it is unlikely that Rand would have ever (à la William Jennings Bryan) explicitly denied that man was a mammal, her philosophy, at times, seems to blissfully evade this palpable fact. Indeed, in some ways, this evasion is worse than an outright denial. Bryan, because of his belief in the myth of original sin, could at least be brought to recognize those actual characteristics which human beings share with animals. Rand, on the other hand, saw such characteristics (provided they were not merely physical) as defects acquired through evasion and lack of focus, rather than intregal aspects of a functioning animal.